"What's striking is that autos were very strong in both June and May, up 0.9% and 0.8% respectively, with restaurants really showing unusual acceleration, up 1.5% and 2.6% in the two months. 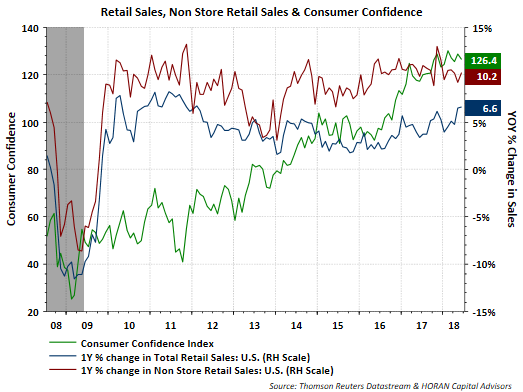 Gains here point to new confidence among consumers and are consistent with the strength underway in the labor market." As can be seen in the above chart, non store retail sales, mainly e-commerce sales, continue to increase at a year over year 10% growth rate. 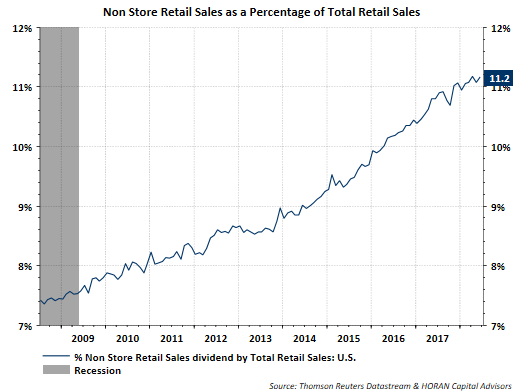 This faster growth relative to the total results in non-store sales capturing a larger percentage of the overall retail sales number. For June non store retail sales is now 11.2% of overall sales and does not appear to be showing signs of slowing.